Flowers and plants come in endless varieties, colors, shapes, textures and sizes and add natural beauty to any surroundings. Grown indoors or outdoors, and in the ground or in containers, flowers and plants can also provide sweet aromas, air-cleaning qualities, vivid blossoms and tasty treats. Proper care is vital, no matter what type of a plant or flower you grow. Every plant requires certain basic elements to survive and flourish. Select the proper location for each plant or flower. Read the marker or seed packets provided for precise information on the amount of sun needed and other important details about the best growing conditions. Place any sun-loving plants in sunny locations, such as near windows for indoor plants or away from structures and trees for outside varieties. Put shade-loving ones away from windows (inside) or under shade trees outdoors. Plant your flowers and plants at the correct time. Indoor plants can typically be planted all year 'round, but some outdoor plants and flowers require plantings at specific times, such as spring or summer bulbs, annual flowers and summer or fall vegetables. Give the plants enough room to grow. Space the plants and flowers grown in the ground, according to the mature height and width requirements listed on the markers or seed packets. As they get larger, replant potted plants in bigger containers for continued growth. Provide the best possible growing medium. Use top quality soil for plants grown in pots or containers. Mix organic matter or compost deep into the ground to enrich the soil for flowers and plants grown outside. Supply the proper amount of water for the plants and flowers. Follow basic rules when it comes to watering: provide 1 inch of water per week during the growing season for outdoor plants when rainfall is infrequent, and thoroughly water indoor (or container) plants when the top 2 inches of soil is dry. Make sure plants in pots are well drained. 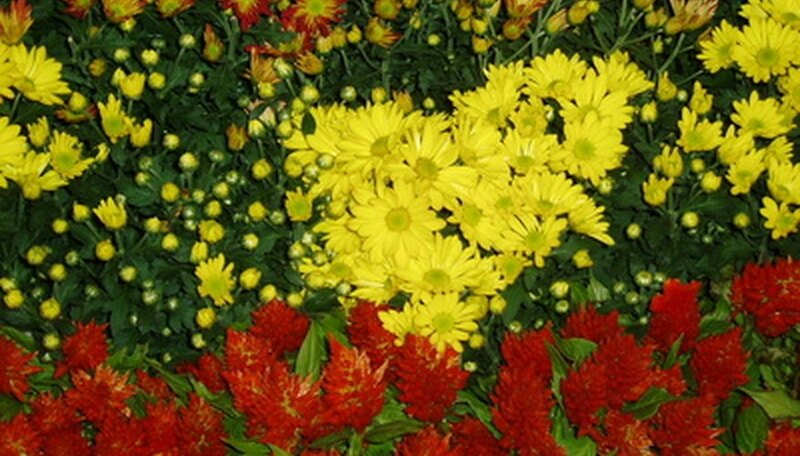 Fertilize your plants or flowers according to the variety grown and the existing conditions. Try to use fertilizers designed specifically for the type of plant in question, such as ones labeled for houseplants or certain vegetables and flowers. Test your soil for more detailed information about the plants and flowers you grow. Contact the local extension office, nursery or garden center for soil testing. Improve the soil and fertilize your flowers and plants according to the results of the testing. Inspect your plants often for any signs of trouble, such as pests or diseases. Look over all parts of the plants for any changes in texture, color or form. Identify the problem with the help of a specialist from the nursery or extension office. Inquire about the control or treatment needed. Add 3 to 4 inches of mulch around the base of flowers and plants grown outside to keep out weeds and to maintain moisture in the soil. Leave at least 3 inches clear around the stems of the plants.